So....sympathy was not the first thing that popped into my mind when I saw this stamp set, but I find this sentiment perfect for expressing our feelings for a special loved one. I needed a special sympathy card this week, and I pulled this sentiment from the Forever Lovely stamp set, along with the beautiful coordinating die set, Lovely Flowers. These dies are amazing! The edgelit die used on this card creates the most gorgeous detailed edge, and it has a coordinating stamp, which brings it to a whole new level. And lining it up is as easy as ever using the stamparatus, more about that below. The Pinewood Planks embossing folder used on the front layer adds a little masculine flair. Cut a 4 1/4" x 11" Thick Very Vanilla card base, and score at 5 1/2"
Emboss the front layer with the Pinewood Planks embossing folder before die cutting the edge with the large floral edgelit die from the Lovely Flowers die set. Stamp the flowers in Daffodil Delight ink and the leaves and sentiment in Soft Sea Foam ink. I chose colors that were soft and simple. I used my Stamparatus to get perfect alignment of the stamp to the die cut detail. I die cut the edge of the front layer first, than used the stamparatus to line up the stamp. All the tips are in my video! This bundle works well throughout the year for so many occasions....birthday, sympathy, wedding, anniversary, and even a thinking of you card. Pick up this beautiful bundle from my store today! Let's face it -- sometimes you want a quick & easy card. The large sentiments in the new Carols of Christmas stamp set lend themselves to quick cards. Now, don't get me wrong, there are some great stamps in this set to make amazing cards, but today, I wanted quick! I busted out my Be Merry designer series paper featured in the Annual catalog, for a traditional Christmas color combination, and added some gold glimmer paper to dress it up. The Quilted Christmas 1/4" ribbon from the Holiday catalog was the perfect ribbon choice to pull my colors together. The gold enamel shapes are a must with gold glimmer paper! Quick Tip: Adding an embellishment, like enamel shapes, rhinestones, or pearls, can quickly pull a card together. Cut a Cherry Cobbler card base 5 1/2" x 8 1/2", score at 4 1/4"
Cut a piece of Be Merry DSP to 3" x 4 1/4"
Would you like a new Holiday catalog? If you live in the United States and do not have a demonstrator, please contact me and I will get one right out to you! 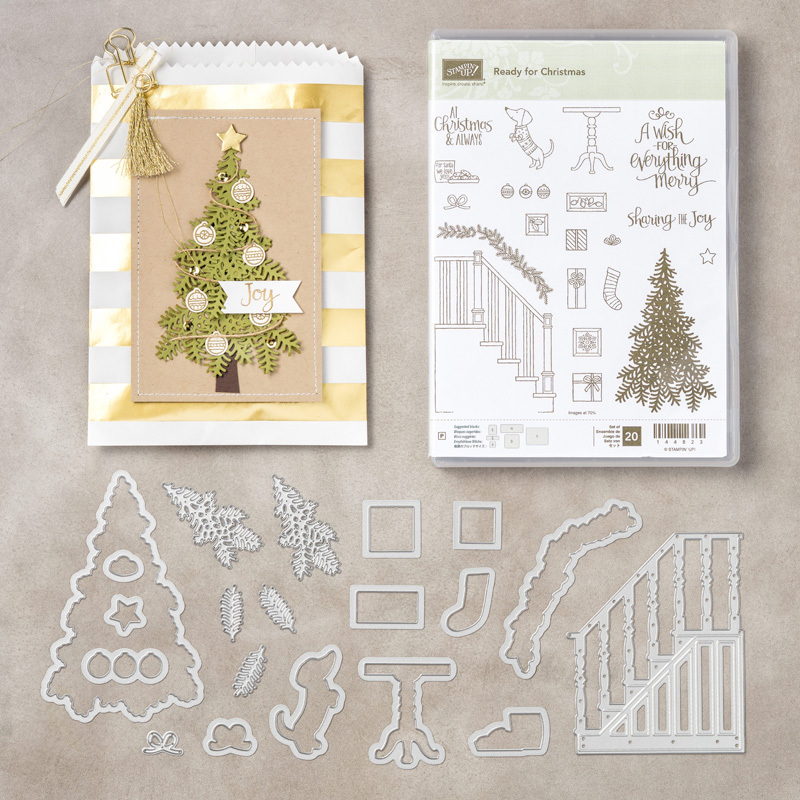 Ready to start crafting for the holidays? Click on any of the products below or click my Shop Now sidebar tab to browse my store!